Pope Francis continued his weekly catechesis on the family by turning to children during his February 11th general audience. He used the prophet Isaiah to open his reflection: “your sons shall come from far, and your daughters shall be carried in the arms. Then you shall see and be radiant, your heart shall thrill and rejoice” (60:4-5a). The Holy Father spoke about how the existence of the child was itself the cause of a parent’s love. “A child is loved because he is a child: not because he is beautiful, or because he is like this or like that; no, it is because he is your child!” While the child is “generated by us,” he or she is nonetheless created for his own sake, and for the good of all. The pope named as “the most gratuitous dimension of love” the fact that we are all loved before we even take our first breath: “children are loved before they arrive,” he said, noting the many mothers in the square who ask him to bless their children in the womb. “They are loved before birth, like the love of God who always loves us first.” It is being a child, Pope Francis said, that is the “fundamental condition to know the love of God.” This love secures human dignity. Parents may learn from God the Father how to help their children to grow, since God “leaves each one of us free but never leaves us alone,” and follows us with love even after we sin. 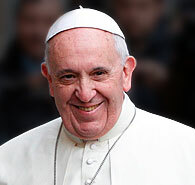 The Holy Father said that God never moves backward in his love but only forward, urging us on. Children are given the desire to build a better world, and they should do so, the pope said, but “without arrogance, without presumption,” and still honoring their parents.